Anissa Helou's life story sounds like something out of Ian Fleming, born of a Syrian father and a Lebanese mother. She moved to London at 21 and studied art and interior design. She soon started working for Sotheby's where she quickly was appointed as the house's representative for the Middle East. She also ran an antique store in Paris for a time. About 10 years ago, Anissa decided to reboot her life. She sold her house, most of her treasured and rare belongings at auction and began to seriously pursue her latest and current passion which is spreading the beauty of Mediterranean cuisine. 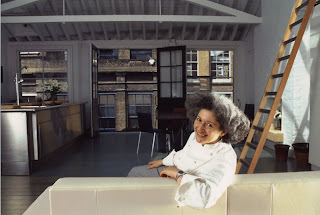 Her books like Mediterranean Street Food and Lebanese Cuisine have introduced many western foodies to the exotica that is food from the Mediterranean. MLAF: Do you think it is harder to be creative when baking as opposed to cooking? AH: "No, I don't think so, as long as you are aware of the need to be precise and to follow the correct measures, percentages, etc. you can introduce your own flavorings into a bread recipe but you cannot really change the formula for the dough. it's easier in savory pastries, pies and tarts but it is more in the make-up of the filling that you can be creative rather than in the pastry, although you can be creative there by substituting one type of pastry to another, or changing the fat used, for instance use butter instead of lard or olive oil instead of butter. " MLAF: Was it different writing a book that concentrates baking as opposed to a typical cook book? AH: "Yes, again there was a need to be very precise in both writing and testing the recipes. sometimes the research was frustrating. i remember one visit to a Greek island to meet some bakers and all of them unfailingly, told me that they measured 'by eye', ie. by looking at the amount of flour or yeast or water, which was no good to me as i didn't have the years of experience they had making a bread or a pie. this meant that i had to make up my own measures to try to approximate the recipes they gave me. it worked with some like the sweet bread and not for others. of course, this also meant a lot more work and sometimes having to ditch recipes that i had liked because i couldn't make them work." MLAF : Is there a difference in approaching baking as opposed to cooking (emotional or otherwise)? AH: "Well, baking is a great occupation. it is very nice to work with dough, and I always knead by hand. and at the end of baking, the smells that fill the kitchen are always incredibly appetising and never overpowering like with a highly spiced dish, or with cooking fish, or frying. and because of the need for few ingredients, which you would normally have in your kitchen cupboard or in the freezer (yeast), it is very gratifying to know that you can wake up in the morning and decide to bake a bread without having to worry about shopping for the ingredients." MLAF: Was it important to you to take all of the pictures in the book or merely a matter of practicality? AH: "It was a great way to concentrate on the bakers and what they were baking, and of course the photos were a wonderful record for me to remember what I had seen on my trips. i also really like photography and I am happiest when i have a purpose for taking photographs as against just going out to look for the perfect shot. the only problem is that i often had to be quick so i couldn't spend any time getting the lighting or the framing just right." MLAF: "Your work in other areas such as photography, art and antiques is well-documented. Do these things help you in your work in the kitchen?" AH: "Yes, I attach a particular importance to aesthetics both in my food, and in my writing, and of course in my kitchen. my kitchen is very functional but it is also very beautiful, I never present food if it is not attractive to look at. Even when I am cooking I pay attention to how I arrange the ingredients, and utensils. somehow everything always looks attractive, perhaps because I do not like any kind of mess and I am very neat, and I should say rather fastidious in my cooking." MLAF: What do you think about when you are baking? AH: "All kinds of things: a trip i am preparing; what i am going to say, the introduction to the recipe, if i will have time to go and buy something i need during the rise time, things i need to remember, and so on."